Course Cost £2995 including VAT (full time & part time, or flexible training). A £500 deposit is required. It can be paid in 6 weekly instalments of £415.83 (full time & flexible training option) and 15 weekly instalments of £166.33 (part time). All costs include tuition, a course book and tool-kit. The City and Guilds Level 2 Plumbing Course is great for those who wish to opt for a fast-track way into the plumbing industry. You can begin this course straight away and finish it in as little as 6 weeks. If you don’t have the time to commit 7 days of your week, you can complete the course part time on weekends. The qualification is industry recognised and is brilliant for those who have never had any plumbing training, or who are plumbers and want to learn about a particular area in-depth. During the course you will learn topics ranging from electrical principles and processes, common plumbing processes, cold and domestic hot water systems, to sanitation, central heating systems and drainage systems. Training is practical and theory-based and you are assessed on both areas. You will also receive a level 2 Plumbing reference book and a tool-kit. The training centre has brilliant facilities and you will be guided throughout the course by dedicated plumbing instructors, so you will always have someone available to talk to. Another excellent aspect of this course provider is that if you live far away from their centre in London, there is accommodation available for £20 per night to enable you to commute easily. There are many add-on courses available to complete afterwards at City and Guilds, to further your knowledge. This entry was posted in Training on March 28, 2014 by theob. The U.K.’s offshore oil and gas industry is tackling its “biggest challenge in 50 years” due to the decline of exploratory drilling, possibly endangering a lucrative industry for the British government. But assistance might very well be on the way. As stated in the annual report published by the trade association Oil & Gas UK, only 15 exploration wells were drilled last year, marking a precipitous drop from 2008, when 44 exploration wells were drilled. The past three years have witnessed exploration reach its lowest levels in history — perhaps resulting in the decline of oil and gas production by 40% in the last three years while the efficiency with which oil and gas is produced has decreased to 60% of its highest level, costing the UK economy £6 billion. It is expected that British taxes from oil and gas will decrease by £1.5 billion in the 2013/14 financial year. Oil & Gas UK has also said that the rate of exploration is too low to recover even a small portion of the roughly 6 to 9 billion barrels yet to be discovered. Last year, an estimated 300 million barrels of oil equivalent were unexploited to the high cost of recovering the fuel. 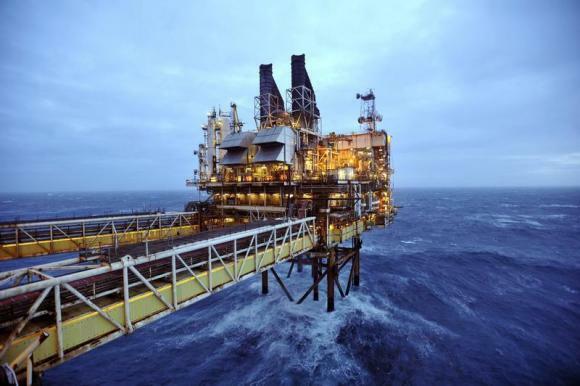 Furthermore, the annual activity survey by Oil & Gas UK revealed production costs have increased by 15% over last year. In addition, the average cost of extracting a barrel of oil increased 27% in the last year to reach £17. Oil & Gas UK’s report was published as Prime Minister David Cameron has been working to convince Scotland to remain in the United Kingdom, vowing to support efforts to increase oil and gas extraction in the North Sea (which the UK relies on for more than half of the country’s oil and gas used). Offshore oil and gas development is considered an important factor in the minds of Scottish voters as they decide whether to become an independent country in a referendum in September. Despite the decrease in exploration drilling, capital expenditure in the U.K. offshore oil and gas sector is projected to reach around £13 billion, a figure that would represent the second highest year for investment. However, investment is projected to decrease by nearly half within three years, according to Oil & Gas UK. Meanwhile, the production in 2013 was 1.43 million barrels of oil equivalent a day as a result of new developments and an emphasis on production efficiency. Fortunately, production is expected to increase further this year as 25 new fields are projected to come on-stream over the next two years while production will probably reach around 1.7 million barrels of oil equivalent a day by 2018. However, 40% of production by that year will come from new field developments. As for assistance that might be on the way, the U.K. government has announced that it would facilitate the implementation of Sir Ian Wood’s recommendations for maximizing the UK’s remaining offshore oil and gas resources. Wood, a retired businessman who served as the chairman of Wood Group from 1982 to 2012, has recommended—among other things—revitalizing exploration to ensure recoverable oil and gas resources in the UK are fully explored and exploited in addition to investing in extending the life of the existing infrastructure to process oil and gas resources. According to Wood, the changes would bring at least £200 to the economy over the next 20 years while the UK government said that changes would result in the production of three to four billion additional barrels of oil (UK oil and gas, 2014). Maximizing domestic oil and gas production would strengthen Britain’s domestic energy security while reducing the country’s reliance on imports. This entry was posted in Uncategorized on March 5, 2014 by theob. 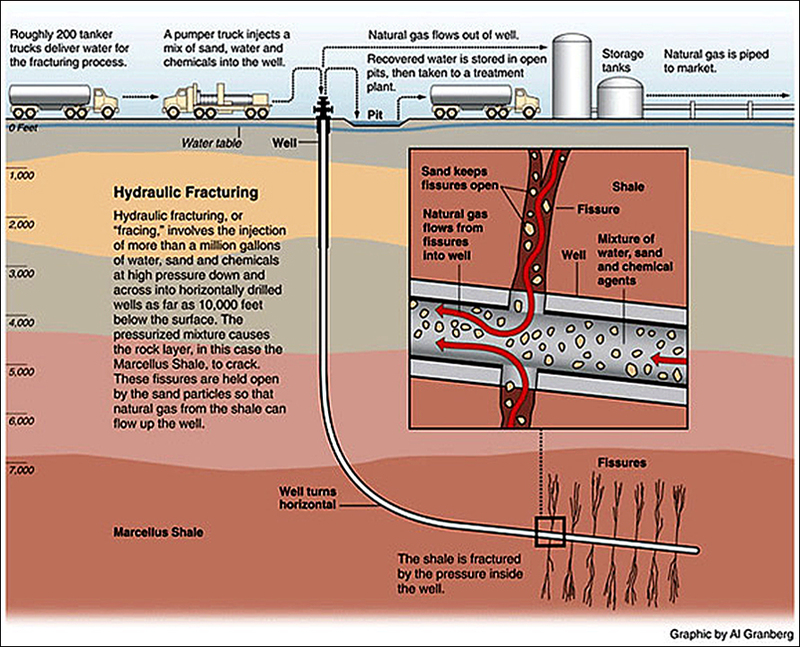 Fracking, or hydraulic fracturing is the process of extracting natural gas from shale rock layers deep within the earth by drilling down and directing a high pressure water mixture at the rocks. The process has helped to develop America’s oil and natural gas resources for nearly 60 years. However, fracking has barely been used in the United Kingdom. Recent estimates suggest that there are enormous reserves of shale gas underneath Britain. Extracting the gas could potentially solve the UK’s future energy needs, reduce energy bills, bring in massive amounts of foreign investment and create thousands of jobs. Preliminary research suggests that fracking of shale gas could contribute significantly to the future energy needs of Britain. In the US, domestic oil production has been greatly increased and gas prices have been driven down, all thanks to fracking. There is speculation the UK could enjoy the same benefits if it were to use the technique. Large deposits of shale gas have been discovered and if extracted, can help secure energy supplies and reduce energy costs. This presents a massive opportunity to help families struggling with their bills. Shale gas is also more environmentally friendly. According to the Committee on Climate Change, shale gas can have lower emissions than imported liquefied natural gas (LNG) provided that the production is well regulated. It also presents an opportunity to generate electricity at half the CO2 emissions of coal. Cheaper energy is not the only benefit of fracking. Major companies such as Total and Centrica are pouring in hundreds of millions of investment into UK shale projects. According to British Prime Minister David Cameroon, fracking could bring in £3bn of investment and deliver a large economic boost. The industry will require more people such as geologists, engineers, construction workers, business analysts, truck drivers, public relations staff, etc. Demand for cement and steel manufacturers, equipment manufacturers and drilling service companies will also increase. This will result in an increased number of jobs in related sectors. All in all fracking could create 74,000 jobs according to the Institute of Directors. Every coin has two sides and shale gas exploration is no exception. 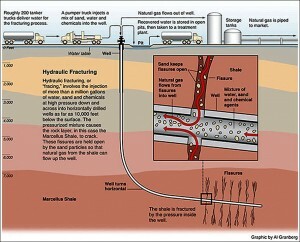 Fracking is a rather controversial technique which is strongly opposed by environmentalists. They worry that the fracking process can result in small tremors. However, these tremors are unlikely to cause any damage. The other major concern is that potential carcinogenic materials may escape and contaminate ground water near the fracking site. The industry tries to alleviate this fear by stating that pollution incidents are not inherent risks of the technique but rather the result of bad practices. Environmentalist also argue that fracking is encouraging energy firms and governments to rely on non-renewable fossil fuel, and distracting them from researching renewable energy sources. Taking the risks and benefits into consideration, in the short term, shale gas exploration can provide a much needed boost to economy by creating jobs, bringing in investment and reducing energy bills. The questions is; what if any, cost will there be to the environment. This entry was posted in Uncategorized on February 18, 2014 by theob. You’ve just had your new gas appliance fitted by a Gas Safe registered engineer to the highest standard, but what’s next? Now, you need to consider ways you can keep the heat (and the £s) inside your home. One of the biggest reasons you lose heat from your home, are those small gaps between doors, windows and perhaps even the floorboards that let cold draughts of air into your warm home. Look at them as little gaps where you pour your money every time you turn your heating on and you’ll soon find as many as you can to plug up! For doors, it’s best to make sure outward facing doors are well maintained and made of a suitable and sturdy material. One of the first places to wear on your (wooden or metal) front door is the bottom, where water collects. Many doors have a ‘sill’ at the bottom to stop water from collecting there; check that yours does too. As doors age, they can shrink and subtly change shape, especially if they are wood. This means that small gaps can appear around the frame and the seal may not be as good as it once was. To combat this, you can get small strips of foam to place between the door and the frame to help form a good seal. This is a trick that also works well for internal doors to keep the heat in individual rooms. Another good tip is to put a draught excluder strip (often made using bristles) at the bottom of your front door to stop the wind from forcing its way in. You should also pay attention to your letterbox, as a loose box flap means the wind will get in and your valuable heat will get out. For double glazed front doors, the above shouldn’t be a problem, as the plastic won’t rust and a good seal is made between the frame and the door; just be sure that your letterbox is secured! Think of your own body. Most body heat is lost through your head, and it’s really difficult for some people to keep their feet warm. To save on your gas bills, you also need to consider your home’s head (roof) and feet (floors). Loft insulation is a must if you’re to stop your pound notes floating away into the atmosphere. On ground level, you can also make a big difference to heat loss and this is a place that many people overlook. It is essential that air be able to flow beneath your house if you have a suspended timber floor, so there are small air vents that allow fresh air from outside to get into the gap between the floorboards and the foundations. Most newer homes have concrete floors, but it can be good to insulate these also. If you have rooms above places that are not heated, it may be a good idea to insulate them, as they will also loose heat. Good quality underlay can also do a great job, and could kill two birds with one stone if you do the right research before making your purchase. For your roof, you need to get some good quality insulation up there because as we all know, heat rises. Inside your house, you can do several things relating to your windows and walls to stop heat from escaping. Aside from cavity wall insulation, having more than one layer of wallpaper on your ceilings and walls can help in the fight against heat loss. Just sit in an unheated room, then cover your legs with some paper and see what a difference it makes. Double glazing is a popular way of stopping heat loss through wooden window framed single pane windows, but what can you do in the meantime? There are products, rather like cling film that you can put around your windows that make them into ‘double glazed’ windows. You could achieve the same effect using cling film, but even better is bubble wrap. With bubble wrap, you lose the ability to use the window, although you’ll still get light through it, so it’s not a tactic you’d want to use on all of your windows, but if there’s a room or a few windows you don’t use, it may still be a good option. Just remember to give the rooms a good airing out every so often. The front door is a huge area, and when open, it acts like the plughole in your bath, sucking out all of your warm air. Imagine having a door like that on the International Space Station? All of the oxygen would be sucked out and the astronauts would all die! To stop this from happening, they use air locks as a barrier between them and space. I’m sure you’re familiar with films like Alien and Armageddon? Why not make your own airlock? We call them ‘porches’ on earth. A porch will make your house more secure and create a barrier stopping all of your heat from being sucked out into the street. I know the best thing about gas central heating is that it heats the whole of your house from a single gas boiler, but there’s a trick you can use to reduce how much gas you use. If you’re not using a few of your rooms, how about turning off the radiators in those rooms? Allow the heat to be concentrated in the areas you need it most and save energy! These are just a few things you could try, so why not share your own energy saving tips in the comments section below? We look forward to hearing from you! This entry was posted in Energy Tips and tagged draught excluders, gas bills, heating, insulation, saving money on December 13, 2013 by theob. The results of a recent Ernst & Young survey have revealed that the biggest concern currently facing Britain’s oil and gas industry is the recruitment and retention of talent. As with other UK industries, oil and gas companies are reporting particular shortages in the area of engineering. The problem is not that British candidates aren’t up to the job, but a convergence of several factors. Firstly, it takes time for new talent to come through and replace those who have left the profession after retirement. Britain’s oil and gas industry is also competing for talent with overseas industries who are often paying much larger salaries than those available in the UK. Despite these potential problems, confidence in the industry appears to be very high and as such, companies are actively recruiting, but the question on everyone’s mind is how to improve recruitment and retention, with problems for operators more than doubling in this area over the past year. To help with this issue, the Scottish government has provided over £6m in funding to provide training facilities for the industry. North Sea based companies are also doing their part, with wages expected to rise steadily over the next few years to continue to attract the right talent. The average wage for this year will probably settle at around the £70,000 mark. The bottleneck in bringing on board new talent and the lure of foreign pastures is sure to put more pressure on recruitment, but it is essential that these problems are overcome to ensure that such a vital part of the UK’s economy continues to grow and thrive. This entry was posted in Gas Production and tagged north sea, recruitment on December 3, 2013 by theob.